We are very close to release LibreOffice 4.4 and I thought I’d share my thoughts on the work that has been put into this new branch and what the general idea is about it. LibreOffice 4.4 is unusual; as a major release you may expect some important underlying change in its architecture, or the inclusion of a set of major features. The 4.4 does include several important features and improvements, most notably for Impress and the much forgotten HTML editor (the comprehensive release notes may be found here). But the most important details are not to be found in this area. If you want to understand where the 4.4 branch is headed, I think it is useful to keep two fundamental trends in mind. Both the official announcement and the detailed release notes point in one direction: user experience. An unusual number of features are actual user interface improvements, from better looking toolbars, menus, colour selector, to a full set of icons finally arriving on OS X. There is an untold explanation about this sudden flurry of UX novelties. Several months ago, the small design team of the LibreOffice project was struggling to accomodate both the incoming set of artwork requests for marketing or advocacy purposes and the actual need to contribute to the software itself; all this, unfortunately, despite an agreed on and working process encompassing every step from the idea to the actual design blueprint to be developed by any willing developer. The design team received the help of a few really motivated people who started to launch UX surveys around Twitter and work on icons design. Then one of the core developers of LibreOffice decided to help the design team by accelerating the inclusion of design blueprints into actual code. As a result, iconsets became completed, new elements of user interfaces appeared, got tested and were finally integrated in the software. The design team is thus on a very creative sprint and you should expect more of these new designs and interface elements in the coming releases. There are several features as well as announcements that are helping set a fresh picture not just on the software itself but on how you can improve your daily workflow. Since about two years, various releases of LibreOffice have shipped with a CMIS connector. This tool allows you to connect to various content management systems, from SharePoint to Tibco, Nuxeo, Oracle and several more of these platforms. With the 4.4 the tool has received several improvements as well as the ability to connect to the OneDrive storage cloud by Microsoft. 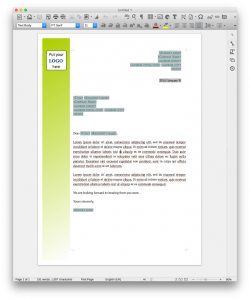 If you add to this connector the recent announcements of the work we are doing on Android, you may realize that LibreOffice is increasing its focus not just on the software features itself, but on the document and its processing logic. The real debate, I think, is indeed not one where we ask whether the Document Foundation is late in the game of mobile apps or Software as a Service. The important discussion in my not so humble opinion is what can the Document Foundation do to improve the experience and the productivity of the user on its documents. Today, this means being both able to handle documents in a myriad of formats and ensuring they are accessible and editable pretty much anywhere so that the logic of the user with regard to its documents (why the user is even handling documents in the first place) is understood and implemented in the best way possible. The document logic must also involve the ability to store files on platforms that will distribute the files to several other users so that they in turn may edit or comment on them. This is how the ability to manipulate documents in various contexts (mobility, computers, in the cloud, etc.) and track changes and comments makes sense. The 4.4 release is firmly headed in this direction and as we will be moving forward through 2015 it will only become more visible. All in all, this upcoming release makes me happy, not just because of the big trends I’ve just outlined, but simply because it’s the kind of releases where you don’t need to explain what “happened under the hood” and justify all the hard work developers invested in the software; for once a great deal of these contributions is visible by anyone, and it’s obviously a rather gratifying experience. 9 Responses to "LibreOffice 4.4 the beautiful"
Awesome news. The effect of changes being made in Libreoffice since TDF was created is arising. I would love see the kind Mac OS icons in Linux and Windows. Keep the awesome work. And thanks for all. well, on linux, it still looks like $hit. Charles, I checked last RC3 and there was no OneDrive connector. If I am wrong, tell me how I can establish connection with this service. >I’m afraid LO 4.4 RC2 has not yet been configured with a OneDrive application. That is, no OneDrive client_id or client_secret has been provided during configuration. And nothing has changed since this time. So If I understand correctly, I must install additionally official MS OneDrive client and only after that I can use LO > OD connector?